What did I know about Simon Baz and Jessica Cruz before buying this issue? Exactly nothing! Zero! Nada! None of them were part of the pre-Flashpoint Universe and I pretty much abandoned most of the DC titles after the New 52 relaunch. So, with these two characters I'm starting fresh. As I'm pretty sure a lot of readers will be starting as well. I read the Justice League #50 last week, though, and I know Jessica became the new Green Lantern after sacrificing herself to save the Flash. 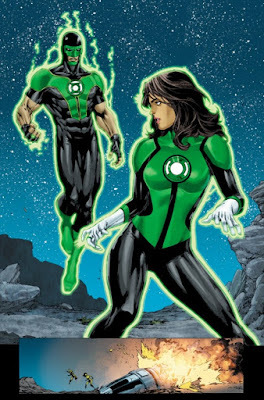 So, now Earth, or Sector 2814, has 6 Green Lanterns: Hal Jordan, Guy Gardner, John Stewart, Kyle Rayner, Simon Baz and Jessica Cruz. The starting point is that, at least for now, Simon and Jessica will be the only ones to be on Earth since the rest of the group will join the Green Lantern Corps to fight a huge menace. Simon begins his new issue suffering attacks to his personal life for being muslin and as he tries to clean the word "terrorist" from the façade of his house, I start to understand how deep the character is and his motivations to prove himself to the world. On the other hand, we have the Corps newcomer, Jessica, who is in doubt why she was chosen by the ring once she's not sure herself if she's really able to overcome fear. 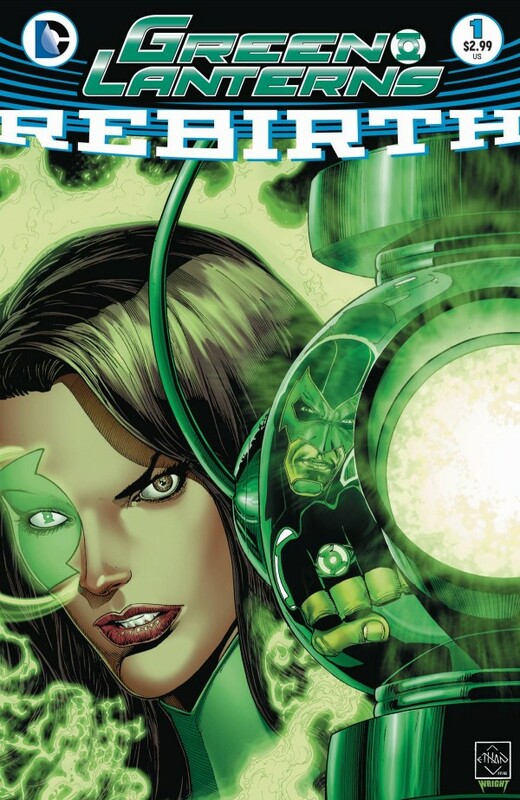 The two newest Green Lanterns are summoned to face a Manhunter who ends up being a test promoted by Hal Jordan, who notices Simon and Jessica do not get along. So he makes them partners, who will share the same power batteries and will have to be together at all times while learning how to be better heroes. Also, while the Corps are busy and no one is close to train them, the Justice League will be responsible for doing so. As you may know, Simon and Jessica will be taking Hal's place in the group. We know something is good when Geoff Johns is there as writer and Ed Benes is providing the art. There's no way it can go wrong. The issues ends with a great cliffhanger, a plot that is intended to be as good and intense as Blackest Night and Brightest Day. Let's wait to see what is coming for these two unwilling partners.